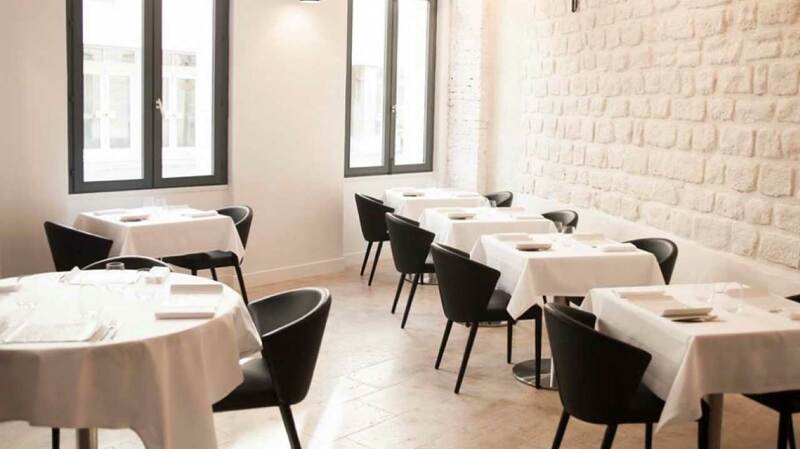 Restaurant Pages, is an unassuming Paris restaurant where Japanese chef Ryushi Teshima takes the art form that is French cuisine and blends it with Japanese food culture, applying the skill of a master craftsman driven by the quiet pursuit of perfection. This combination ultimately creates a wonderful Restaurant experience, so much so, that Restaurant Pages finds its way to the top of the Top Paris Restaurants in the pages of my journal. 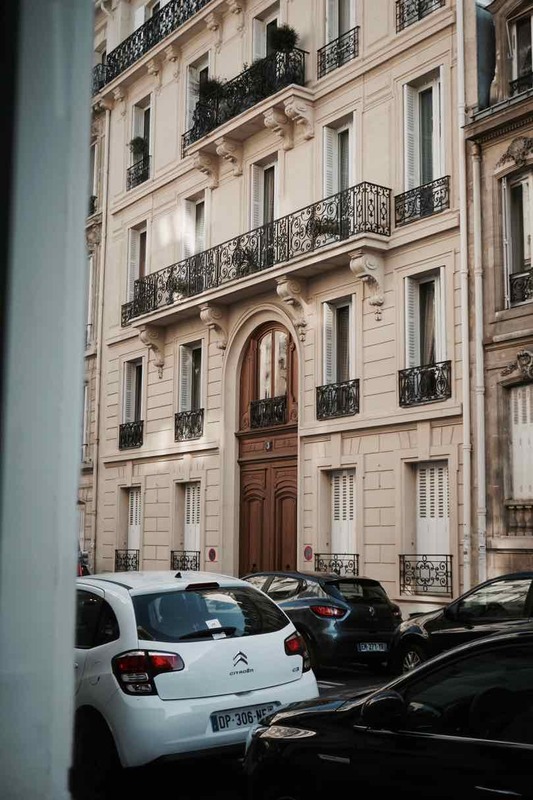 It is our fascination with finding and exploring the cuisine of new and emerging culinary artists that led us to just off the Arc de Triomphe end of Champs-Élysées to Restaurant Pages. 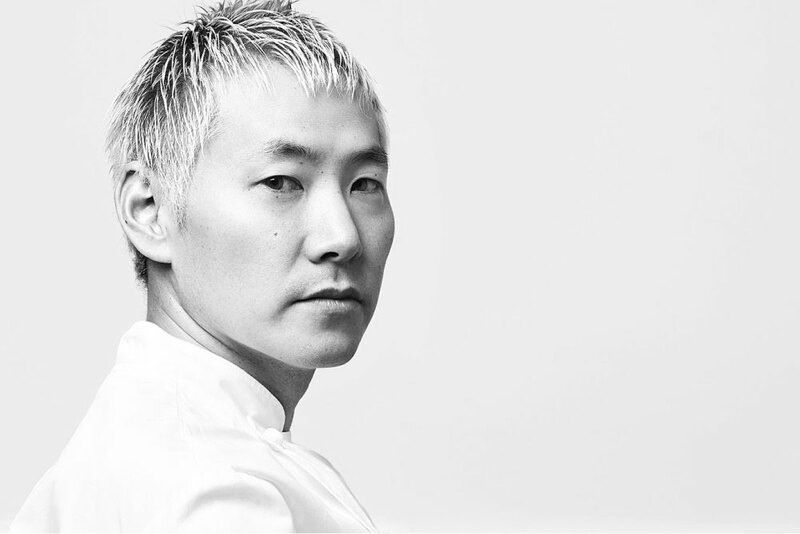 Chef Ryushi Teshima, known as Teshi has boldly stepped out to open his own restaurant with his wife Naoko, herself a talented pastry chef, after beginning his career perfecting his knowledge, working with leading French chef Alain Senderens. 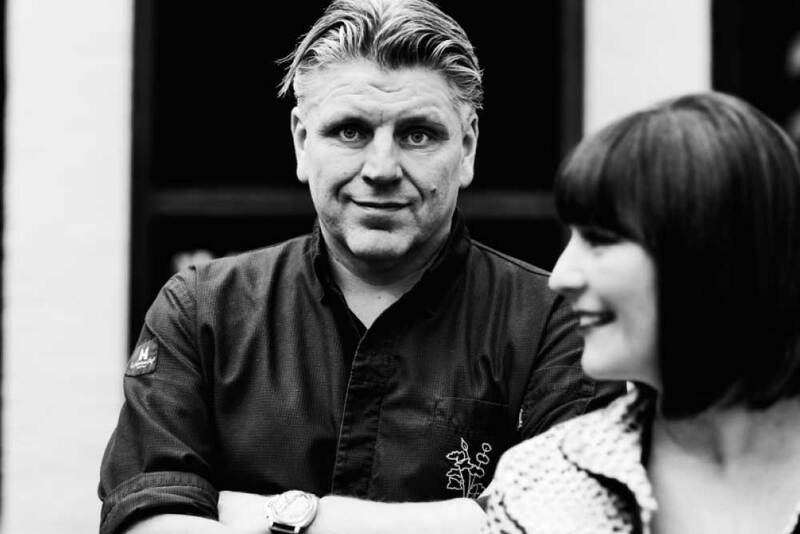 The late Chef Senderens was one of the few early creators on the leading edge of nouvelle cuisine and some credit him as the creator of food and wine pairing. 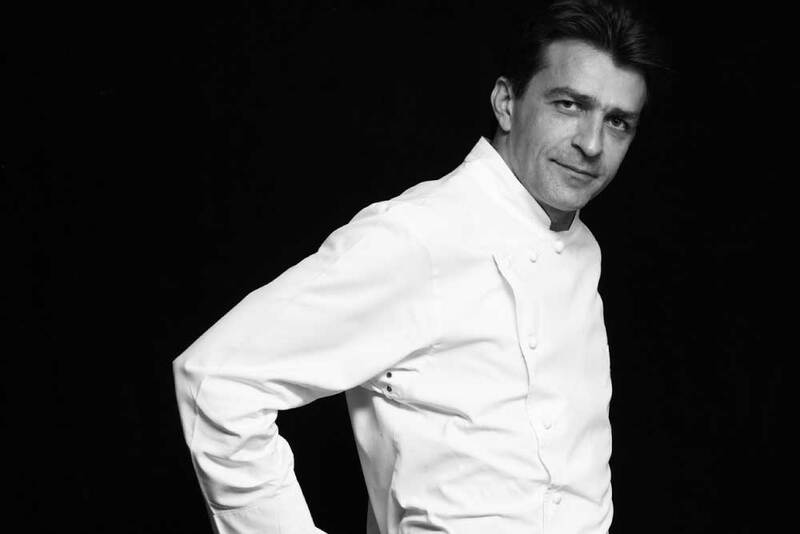 He was also the first chef to hand back his Michelin Stars. Teshi is a self proclaimed perfectionist and has worked very, very hard to perfect his techniques and knowledge. 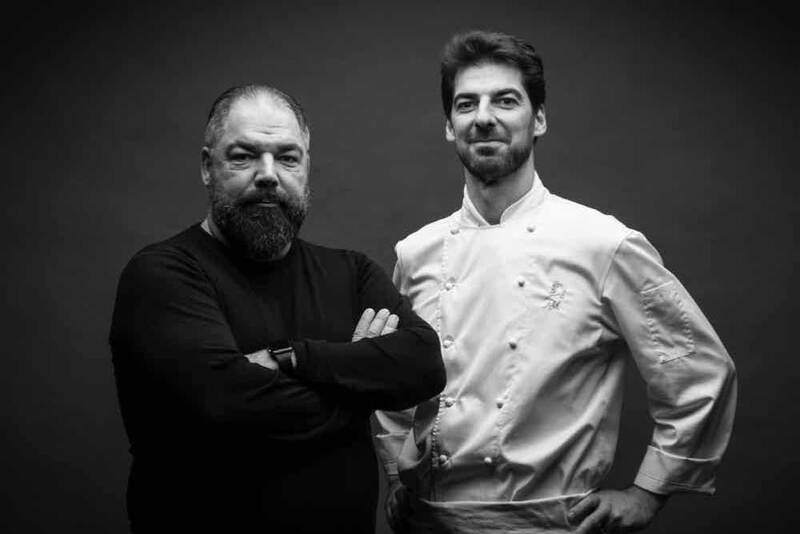 With such pedigree and commitment to his craft we are very much looking forward to experiencing the cuisine he has now developed as his own. The Restaurant Pages space is stunning, I really love it. A simple white space, with white stone walls and pale stone floors contrast with interesting black lights and simple black chairs. The kitchen is open to the restaurant and we are seated at the perfect table to enjoy watching the kitchen crew work. I am fascinated watching a tall young man carefully pulling one petal at a time from flowers to put the final touches on something interesting. Chef Teshi is in the back, his long fringe covering his eyes as he slices amazing looking pieces of beef with absolute steady precision. 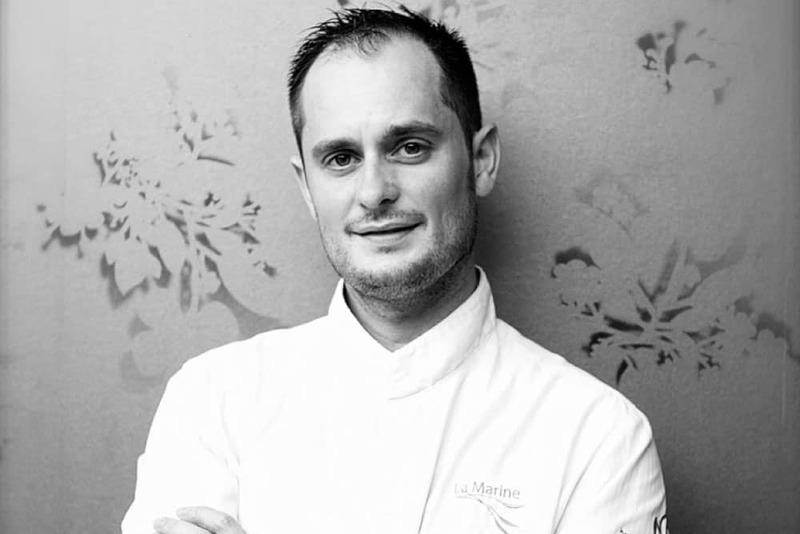 During his development years he worked for three years as an apprentice at the famous Paris butcher shop Hugo Desnoyer at the same time as working full time kitchen shifts with Chef Senderens. Such was his determination to perfect preparing meat and cooking dry-aged beef. 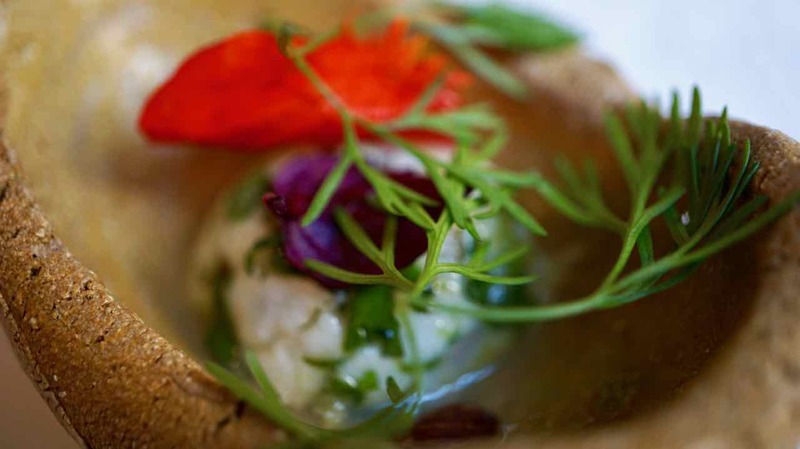 To start, we enjoy a selection of seasonal amuse bouches. 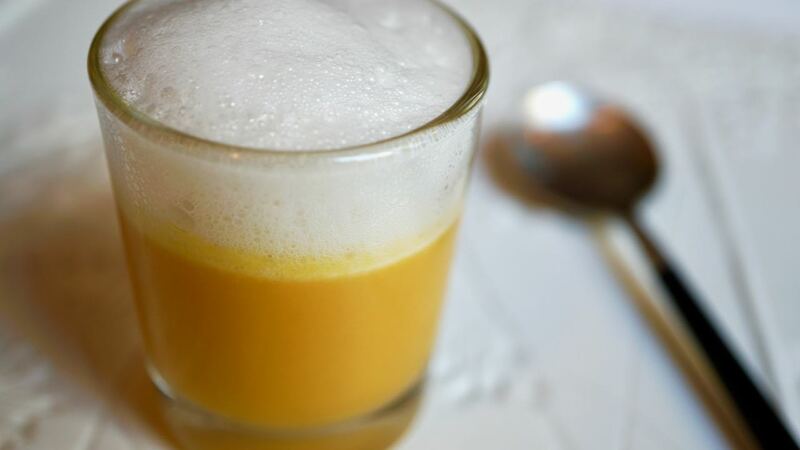 A silky smooth Kabocha soup with a cognac foam is a warming first taste. Kabocha is a type of squash sometimes known as Japanese pumpkin. 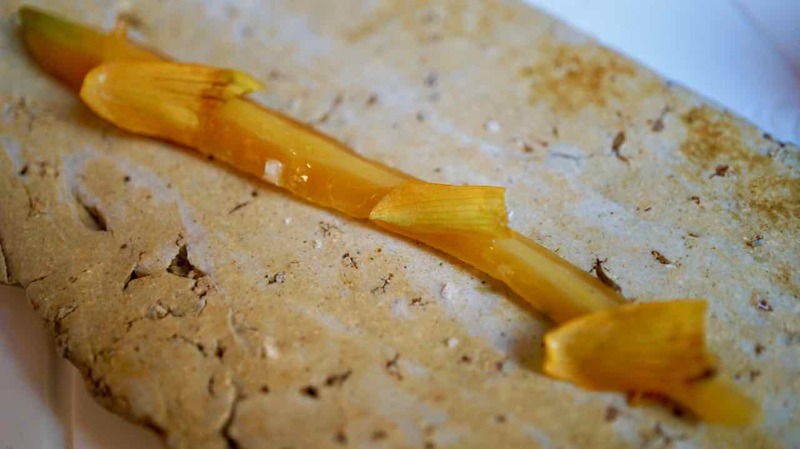 It is a light and quite sweet vegetable, a little more delicate than other types of pumpkin. Then on a beautiful blue green plate a veal tartare generously anointed with caviar. A very refined and simply flavoured dish. The veal is so mild and milky with an interesting smokiness and the caviar simply seasons it adding a perfect yet rather decadent touch. Scallops ceviche served in pretty little piece of clay that looks like several of the items I have that my children made in school, so very pretty! 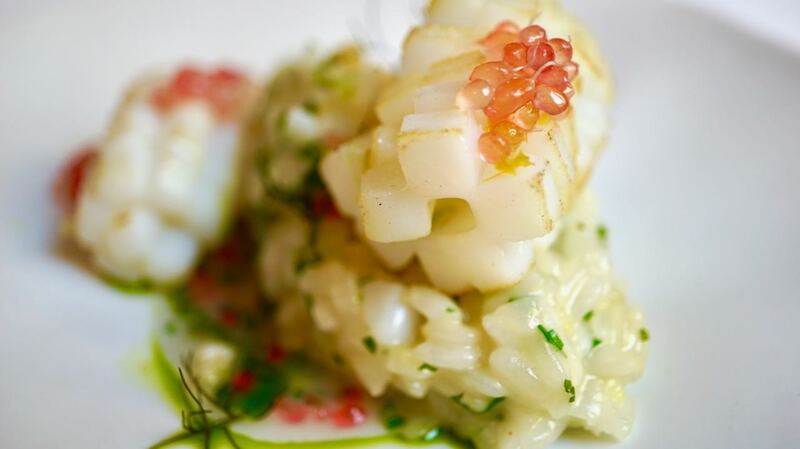 The ceviche is stunning, sweet scallop barely cooked by the zingy citrusy emulsion. It is a very beautiful little taste. And then a very simple little carrot, the dear little thing is raw and seasoned with cumin. It’s a perfect indication of how important the produce that he uses is to Teshi. There is a kind of serenity in everything here, the kitchen is a joy to watch and the floor staff are gorgeous. Our sommelier is delightful and the waitstaff are attentive without being overly so. At the front of the kitchen there is seriously amazing large hunk of Wagyu Beef, so marbled you could say it is really fat, marbled with a little beef. Our menu today includes a carpaccio of Wagyu beef and we are very excited. I had been watching a young chef at the back of the kitchen wielding a big blow torch wondering what he was creating. We find out when our beef arrives presented on a huge scorched beef bone. Thin slices of Ozaki Wagyu beef have been placed on the bone and ever so delicately flashed under the flame. 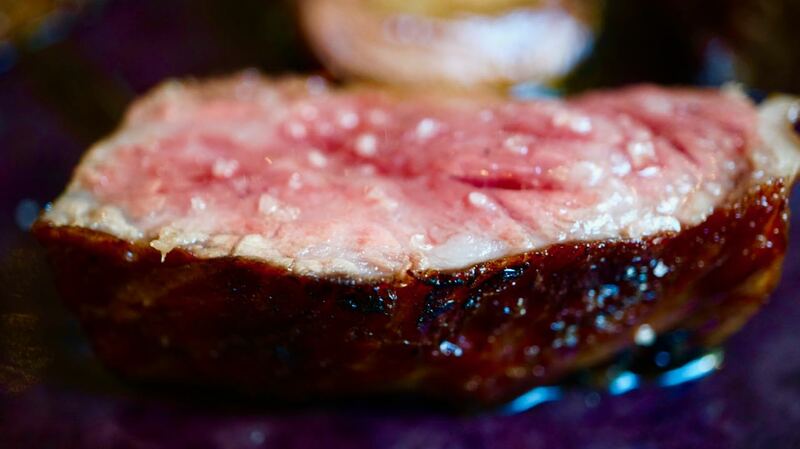 The result is wonderfully smoky notes that accentuate this most spectacular, sweetly flavoured piece of beef. The meat just melts in my mouth, with such a velvet smooth texture. Ozaki Wagyu from Miyazaki Prefecture in Japan is a very rare beef that is grown by Mr Muneharu Ozaki. Types of wagyu beef are not normally known by the growers name but Mr Ozaki’s beef is so special it is named by his name alone. Mr Ozaki spend thirty years perfecting the raising of his cattle before he was happy with the quality of the beef. He grows his cattle with a great deal of care. Preparing their feed, which includes up to fifteen different elements, takes two and a half hours each morning and afternoon. 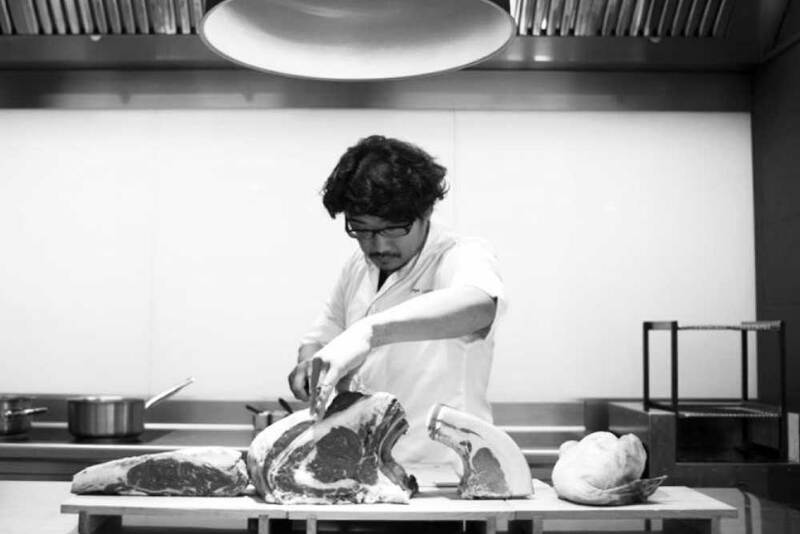 Mr Ozaki’s focus is not about just fattening up a cow, he strives to create flavour first and foremost, making his beef a very unique product. I am so honoured to have tried this delicacy today and the restraint that Teshi has shown in its preparation has very much honoured this beef. 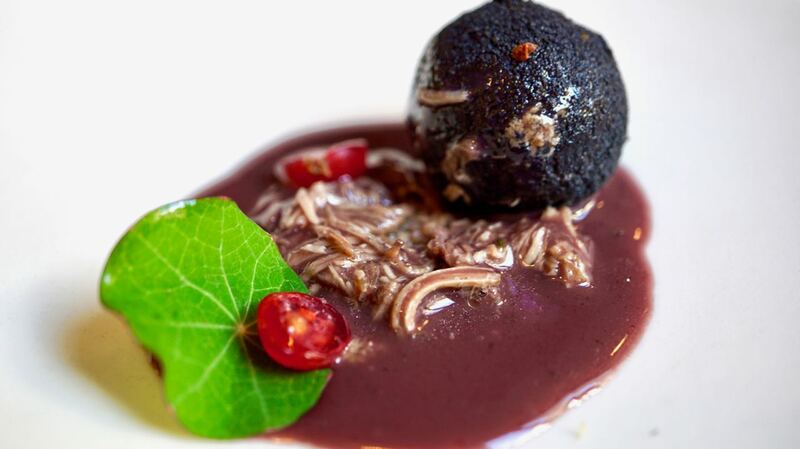 Our next dish is a new one for me, a Foie Gras Cromesquis with duck and red wine sauce. Cromesquis is essentially a little croquette or ball of yumminess. This one is fascinating, a neat little black ball that looks like a dark chocolate truffle, I crack open the firm outer shell to find a delicious creamy foie gras centre. It is just exquisite, like a savoury “Ferraro Rocher darling!”. The Cromesquis was served on a shallow spoonful of shredded duck in a very interesting red wine sauce. The duck sweet and tender and the sauce rather than being a heavy cooked out red wine sauce, is really fresh and vibrant. The distinctive flavour of red wine is still there making it quite a bright sauce.I love it. The finishing little touches to this dish are just perfect. A peppery nasturtium leaf and little tart red gooseberries. I have never had red gooseberry before, I’m more familiar with the light green larger ones. These dear little things are both pretty and really tasty. I would so love to know how Teshi has achieved this dish. Naoko, Teshi’s wife, who has such a gorgeous gentle energy, brings our next course and explains that we have sticky rice citrus risotto with grilled squid and “citrus caviar”. 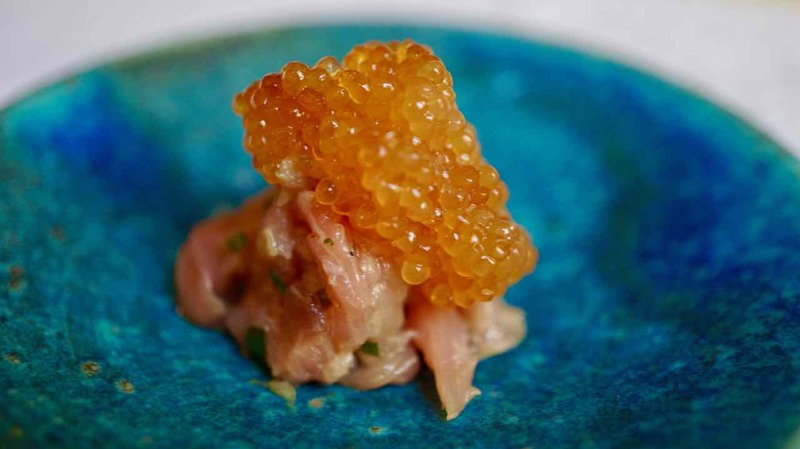 Citrus caviar? Yeah we know this one….it’s of course finger lime, an Australian native fruit that we know. The risotto is lovely and creamy with a bright citrus overtone. The squid is perfect, very tender and just lightly coloured giving subtle caramelised hints. The finger Lime provides vibrant, fresh little pops as each little bubble bursts in my mouth. A very delicately balanced combination of textures and flavours. A very beautiful blue plate is the next to arrive. It is simple, not a lot of ingredients, cod fish, radish and a lovage sauce. The perfection of how each of these simple ingredients has been prepared and the thoughtfulness of the combination of them, is what makes this plate so good. The fish has been cooked no more or no less than what is required to present it at its best. Paper thin slices of radish on top add a fresh texture and bite and hiding beneath is a little surprise of creamy “Noir De Bigorre” Lardo. This is meat from a slow grown Gascony black pig, produced in the Haute-Pyrenees region of south west France. I would love to try it as a standalone product. 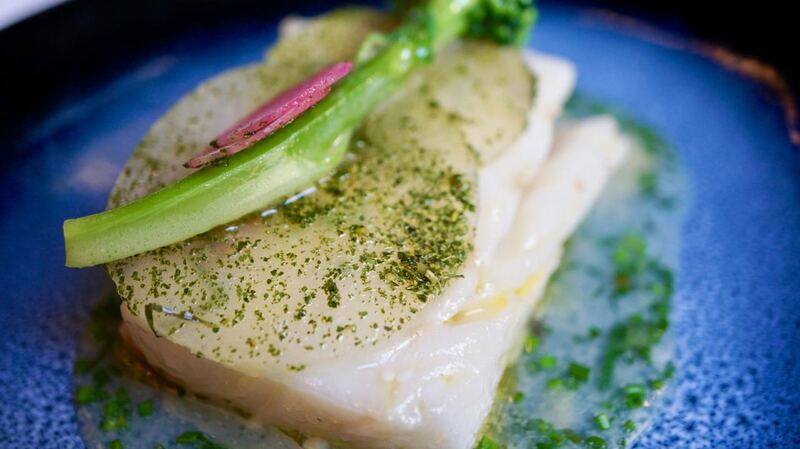 The star of this dish, however, is the cod. Guess who’s coming to lunch? Restaurants are often an interesting opportunity to observe human behaviour, it can be lovely to watch other people get as much joy out of an experience as I do. Occasionally though I am reminded that not everybody comes to fine dining restaurants for the joy of it. 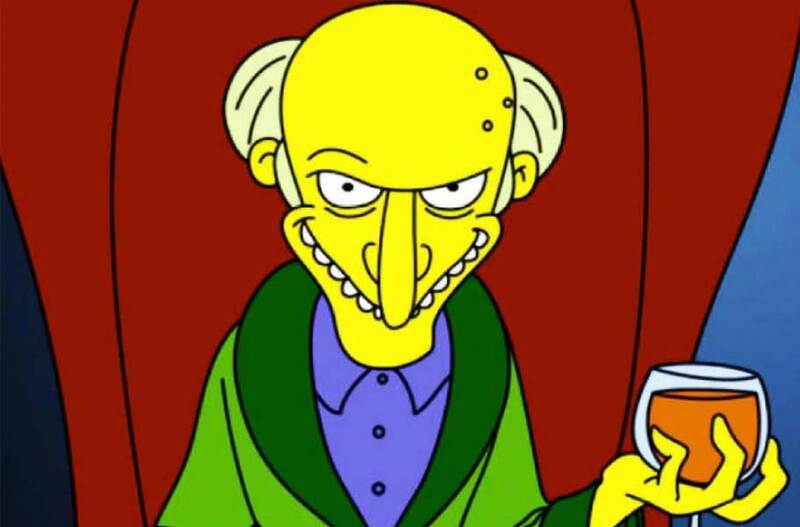 Today across the way, the only disturbance in the gentle energy here was a table of incredibly rude, wealthy buffoons. It was clear the from the minute the first and the worst of them arrived. I’ll call him Gold Buttons (his fancy jacket had a long row of shiny gold buttons that bling blinged every time he moved). He barged in the door and bowled straight into the restaurant pushing past the lovely hostess who was endeavouring to deliver her beautiful warm welcome. Followed closely by the first of his buddies. He strutted over to his table as the poor young lady tried her best to continue to welcome him and offering to take his coat. Rather than having politely removed his coat at the door he disrobed at the table, flapping his coat against other diners while having a loud bolshy conversation with his mate. He shoved coat and scarf at the hostess, without so much as a side ways glance to acknowledge her existence, let alone a ‘merci’. Old mate Gold Buttons continued to be a self important arse all afternoon. Barking demands at the waitstaff, which they very professionally managed. Taking highly animated telephone calls while strutting between his table and the front door and at the table while shovelling Teshi’s lovingly prepared food into his greedy gob with little attention. Never did I see or hear him acknowledge the arrival of a plate or say thank you to the staff who brought it. He certainly had no consideration for other diners. What I did see was a very professional team who despite being treated poorly, continued to do their jobs with care and grace. I have enormous respect for the hours and hours of time, energy and care that restaurant staff put into creating wonderful food and and making sure guests have a lovely time. I never forget how much goes into creating the experience that the diner gets to enjoy. Someone has spent weeks, months or perhaps years growing the produce. Someone has gone out and sourced that produce. Someone has poured their creative energy and soul into developing the dish to best prepare the produce. An artisan somewhere has crafted plates or cutlery. Somebody has thought about every detail; the chair, the table, the light, the music, for the space to serve the produce. Finally miraculously it all comes together through the efforts of the kitchen and the floor staff for the pure enjoyment of a single meal for me; and all I have to do is turn up and enjoy it. I am in awe of this effort and so very grateful! It is that place of gratitude that I choose to stay in and not let old Gold Buttons spoil a moment. All afternoon in between stunning plates of food we have been enthralled with the workings of the open kitchen. It is constant, staff seamlessly transition from one task to the next. There is not a moment lost in the incredibly fluid momentum of Teshi’s Kitchen. Teshi works quietly, focused on his tasks but also obviously acutely aware of every other activity in the kitchen. He has his Binchotan grill behind him and I watch him prepare duck and other meats and place them over the coal. Next comes a smaller bird and we speculate that it might be pigeon. His technique is focused and precise, each cut of his knife measured and deliberate. A little while later Naoko brings another plate. Ahh we guessed correctly, pigeon! Teshi has accompanied his little grilled bird with chanterelle mushrooms, fresh fig and white grape all glazed in a delicate red wine and plum sauce. The little grapes with touches of blackened skin from the grill and the fresh fig are delightfully sweet against the tender, pink and smokey meat. The red wine and plum sauce is just gorgeous. For our final savoury course we are super excited to receive an aged beef degustation. Beef from three different types of beef, aged for different times all grilled beautifully on one plate which we are advised to try in a certain order. 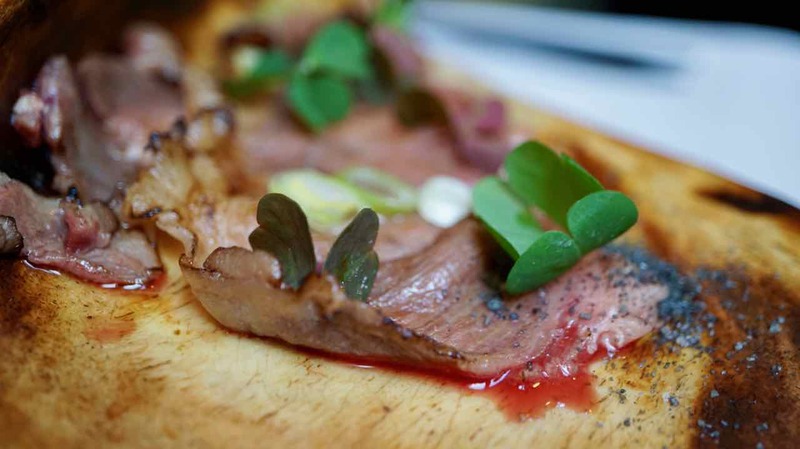 Our first is another opportunity to enjoy the very special Ozaki beef, aged for five weeks. With minimal cooking this beef just melts in my mouth, a wonderfully rich and delicious flavoured beef like nothing I have tried before. 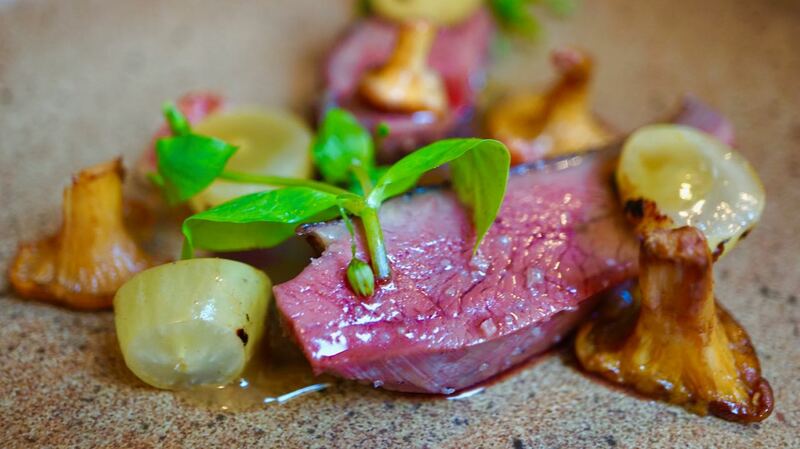 Normande Beef dry-aged for five weeks is known as a viande prestige, a very exclusive product. The Normande is a mixed breed cattle from of course Normandy, where it grazes on the brackish pastures of the salt flats. The breed is perfect for both milk and meat and it is particularly suited to dry-ageing on the bone. Teshi has of course cooked it to perfection. It is a brightly coloured beef, firmer in texture than the Ozaki but wonderfully juicy and flavourful. Finally we have Simmental beef from Germany. Another dual propose breed of cattle, the Simmental is a pretty mix of German and Swiss breeds. Wandering on the open fields of the Alps nibbling green grass and wild alpine herbs, these cattle have a lovely life. Dry-aged for six weeks the beef has an extraordinarily rich flavour almost like it has been marinated in truffle or something, just delicious. What a very, very special experience! 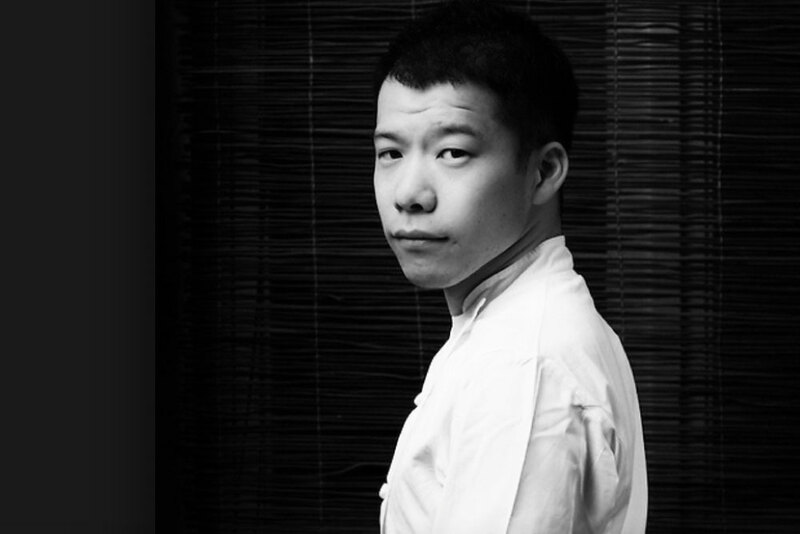 Teshi has sourced the most incredible produce and prepared it simply, cooking it to absolute perfection. 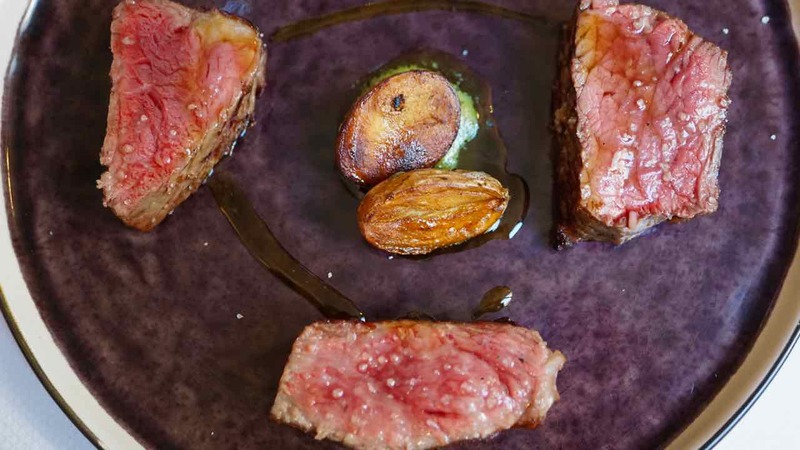 While the richness of the flavour of each of these pieces of beef is just incredible, I think my overall favourite is still the melt in the mouth Ozaki beef! The time has come to move on to dessert. Our first plate is the most fantastically simple yet exquisite idea. 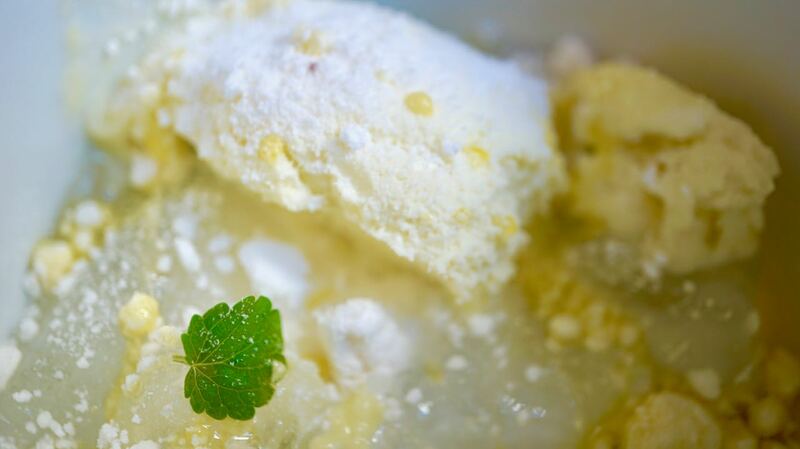 Olive oil ice cream, and Perrier jelly. The ice cream is smooth and velvety with green grassy and peppery olive oil notes. The jelly made from sparking Perrier still sparkles, tingling on my tongue. The most fantastic savoury sweet thing that rings all my bells! I love it! Then to finish, poached pear, chestnut ice cream with caramel jelly. 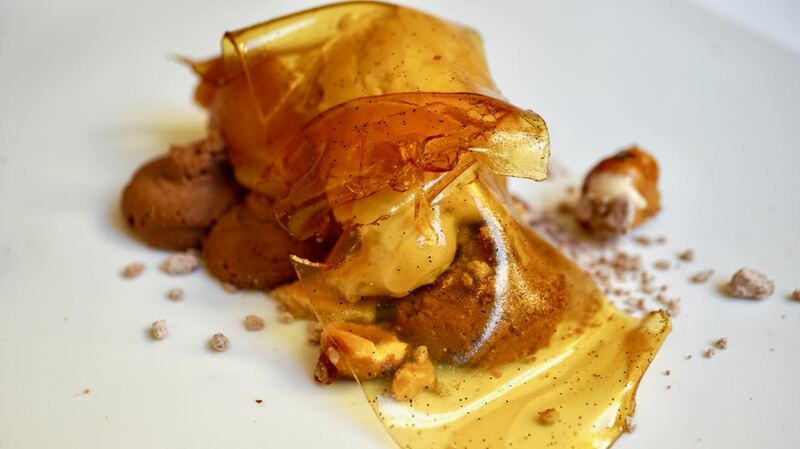 Visually intriguing, this dish is topped with what looks like molten toffee, golden and shiny. But its not a brittle toffee, it is actually a lovely soft jelly that has been draped evocatively over the other elements, teasing you to break through to get them. Delicate pear, poached just enough to enhance the sweetness but keeping the beautiful texture, earthy chestnut ice cream and yummy hazelnut mousse with a little crunch of hazel nut to finish. What a wonderful lunch on so many levels. There has been no trickery or slight of hand magic here. 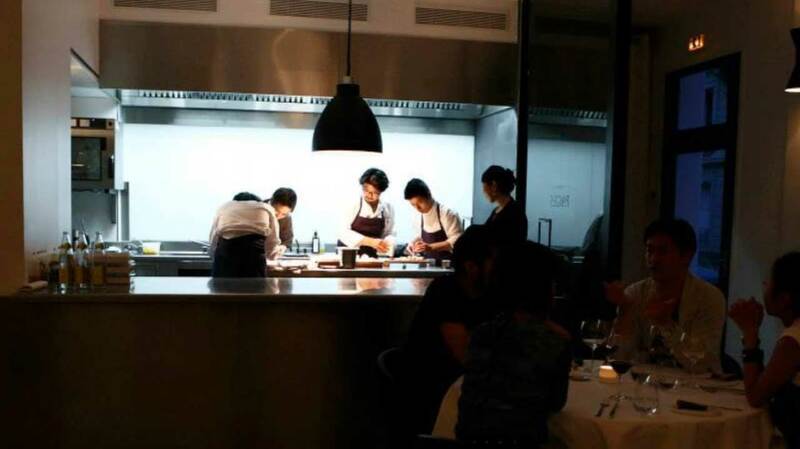 The only magic is that of Ryushi Teshima‘s absolutely clear focus, finding the purity and truth of each ingredient he uses and leading us the diner to it, through the way he presents it. His clearly calculated restraint has allowed us to experience the absolute best of each element he has chosen to put on the plate. There is such a humble honesty in the feeling of this place and I feel honoured to have been welcomed at Teshi’s table. Pages will go down as a riveting page turner and is bookmarked in my journal as a taste of perfection.